UC Irvine undergraduate student, Alyssa Columbus, presents at the 2017 American Statistical Association's Women in Statistics and Data Science Conference. UC Irvine undergraduate student, Alyssa Columbus, presented her research at the 2017 American Statistical Association's Women in Statistics and Data Science Conference. 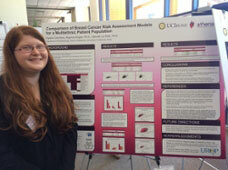 Her poster was titled "Comparison of Breast Cancer Risk Assessment Models for a Multiethnic Patient Population," and she concluded that using more than one model would enable a more accurate determination of breast cancer risk status. Her Department of Epidemiology faculty advisors include Argyrios Ziogas, PhD, and Hannah L. Park, PhD.